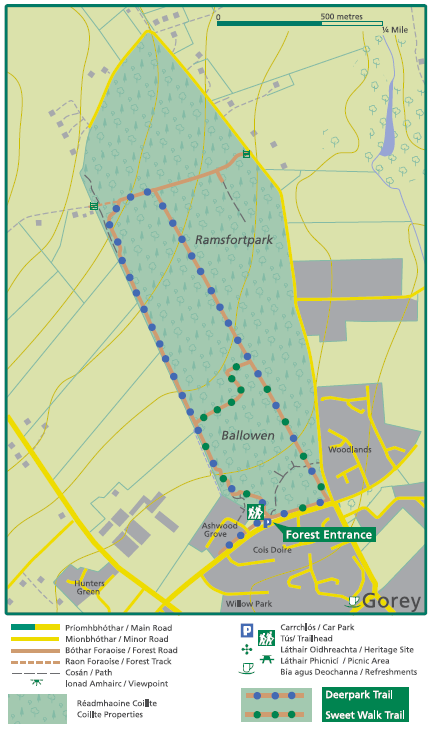 Both these trails start in Willow Park, just 15mins walk from Gorey Main Street. Deerpark Trail: This looped walk weaves through Willow Parkand mixed woodland with occasional views of surrounding hills and Ramsfort House. Listen for the resident buzzard as you walk. The wood is situated on lands which were part of the Ram Estate. The area around the wood was known as the Deerpark. Bishop Thomas Ram was granted lands around Gorey under the terms of the plantation of Wexford in the early 1600s. From the 1800s onwards the Ram family gave the people of Gorey access to the demesne land for walks so it is fitting that they have been made available again in the 21st century. Sweet Walk Trail: This short loop starts at Willow Park. Look out for a wide range of flora and fauna especially in spring and summer. Watch out for jay birds and speckled wood butterflies, and the autumn toadstools. take the first right into Garden City. Turn left onto Ramsfort Avenue. the trailhead is 300m on the left.